Once again, I am in the beautiful Bavarian city of Munich to attend the annual Munich Opera Festival for the month of July. 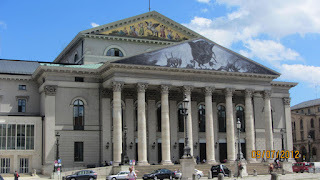 Always exciting in high tourist season, this year Munich (and practically all of Europe) has been facing a particularly severe heat wave, which spells trouble for opera attendees as the National-theater, like most European opera houses, is not air-conditioned. With 2000 bodies in an enclosed space, it can get sweltering in no time. The normally extremely dressy audience aren't about to give up their haute couture just for a bit of discomfort. But the more sensible men in the audience would take their jackets off discreetly once the house light goes down - after all, it's not worth it to suffer heat stroke! 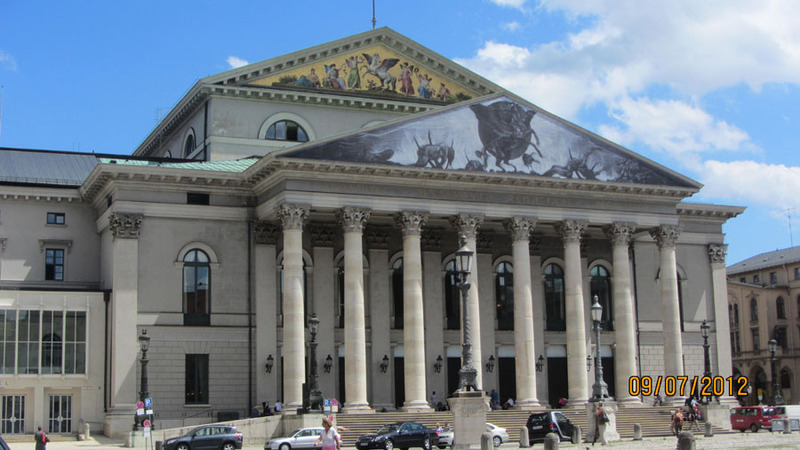 This year's Festival is particularly special because the Bavarian State Opera is unveiling its new Ring Cycle. Actually the four Ring operas were premiered one at a time starting last February, and the fourth opera, Goetterdammerung, had its premiere at the end of June. Then two complete cycles are presented during the July Festival. The stage director for the Ring, Andreas Kriegenburg is primarily a theatre director with relatively little opera experience. 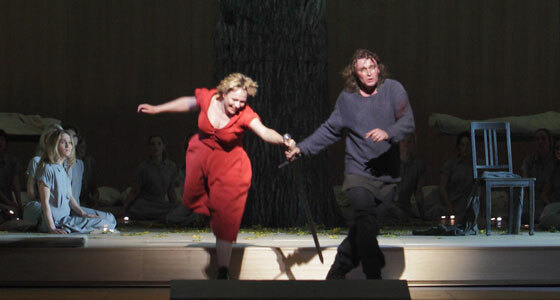 Following his highly successful production of Wozzeck for the Bavarian State Opera in 2008, Kriegenberg was entrusted with the task of designing the new Ring Cycle. Much have already been written about this, and the critics are divided - so what else is new! Having now seen two of the four installments for myself, I can certainly see what all the brouhaha is all about. This is quite literally a human Ring, you can also say it's a low-tech Ring, one that is the polar opposite of some of the more celebrated productions in recent memory, such as the Valencia and the Met Rings. Instead of relying on high tech wizardry, this one has bodies. There is no physical set to speak of, only a few props and pieces of furniture and fabric, and of course the stage mechanisms. 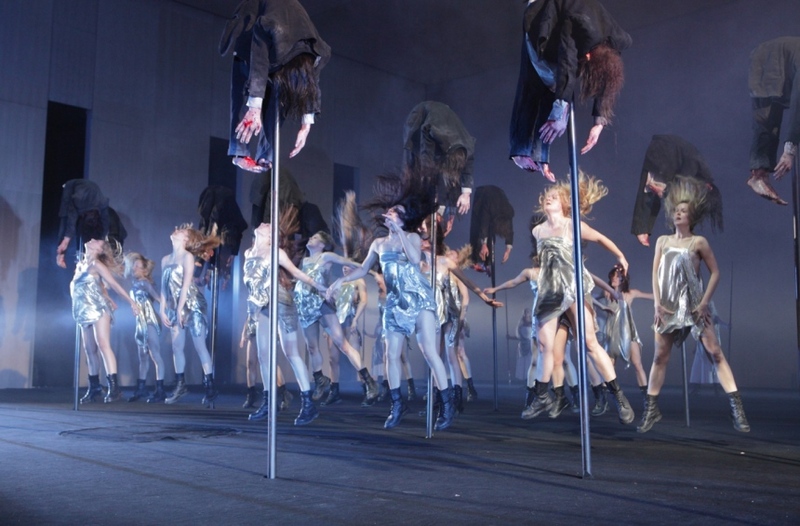 What we do have is the use of the human body, masses of bodies in fact, to form the Rhine in Das Rheingold. I have no statistics to back it up, but my guess is this production probably have the greatest number of supernumeraries of any Ring. I didn't do a careful count, but my guess is well over a hundred. Given the increasing reliance on high tech in opera productions, especially in something as complex as the Ring, the Kriegenburg production is something of a departure. It's interesting to see the masses of humanity that cluster together to form the Rhine, simulating the motions of the waves. 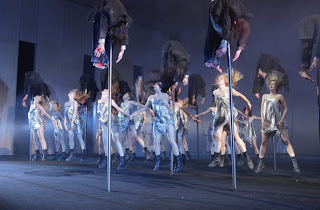 Also, the opening staging with the extras has a strong sexual flavour to it, and why not... Given that all life forms originate in the watery depth, there's something symbolic, even poetic, about the staging. The execution could be a bit more seamless, less obtrusive. If I were to quibble, sitting so close meant the imperfections of the movements of the masses of bodies took away some of the realism. On the subject of the body-driven nature of this Ring, the ideas are always original and occasionally brilliant. The tux-clad men kowtowing to Wotan, serving him drinks in Valhalla (Act Two Walkure), one offering his back as a writing desk, speaks volumes about his stature as head honcho.The recycling of the fiery snake (in lieu of a dragon) from Rheingold to form the ring of fire protecting Brunnhilde was also a very nice touch. The one misfire - to my eyes and ears - by Mr. Kriegenburg was spectacular. Before the music started in Act 3 Walkure, some two dozen women, in the same silver lame bodice as the valkyries, did some sort of stomping routine, complete with grunting noises. The significance of this little episode eluded me, I have to say. 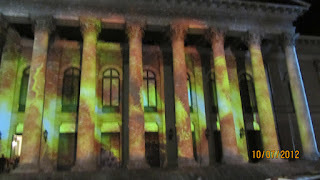 It lasted about 8 minutes, word-less and no music, except for the thumping of their boots. I am afraid to a substantial segment of the audience, it was 8 minutes too long. At about the 3 minute mark, some decided to boo, which was replied with applause by others. The booing intensified and it became a tug of war. In my 45 years of attending operas, this the the most vociferous booing I have witnessed. I only realized later that these women were supposed to be horses. As it was happening, I thought they were "valkyrie-wannabes" doing some sort of aerobics routine! Frankly, any directorial touch ceases to be effective if a substantial segment of the audience just don't "get it." On the other hand, I find the staging of the Todesverkundigung scene and Wotan's Abschied effective and moving, among the best I've seen. 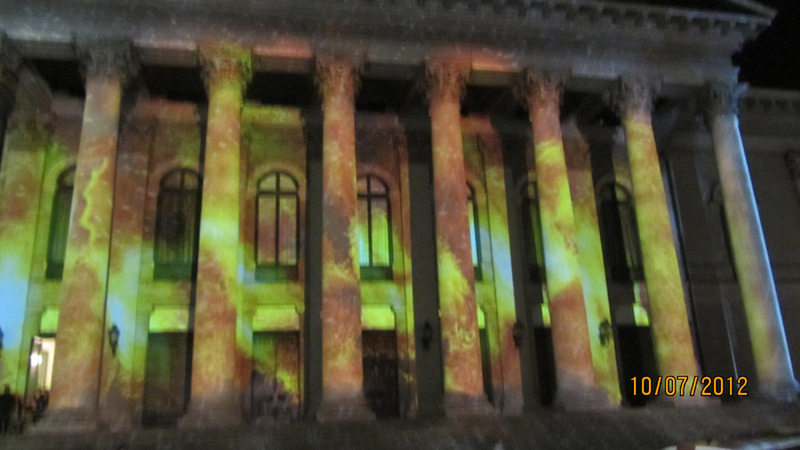 Also very nice was the 20 or so women each carrying battery powered lights in their palms shining the spotlight on the lovers during Wintersturme in Act one Walkure - to me, these women represent 'destiny' lending a helping hand to the lovers Siegmund and Sieglinde.. If there were some reservations about the production, no such reservations existed for the musical aspects of Rheingold and Walkure. The singing was uniformly excellent. Thomas Mayer impressed with his authoritative Walkure Wotan, with a glorious high register, tireless in a very long role. Johan Reuter as thee Rheingold Wotan, with slightly more slender vocal resources, was almost as good. The Loge of Stefan Margita was simply magnificent, and so was Wolfgang Koch's Alberich. Most impressive were the lovers - Klaus Florian Vogt's clarion, sweet tenor as Siegmund and the joy and womanly warmth of Anja Kampe as Sieglinde. Replacing Katarina Dalayman (for unknown reasons) was Irene Theorin, who sang a sensational Brunnhilde. Her Ho-jo-to-ho had the best hi Cs and B naturals in memory. She also looked regal and aristocratic. The casting of Munich is so much stronger than the Met - to be able to replace Dalayman with an equally wonderful soprano like Theorin underscores the depth of this theatre - bravo! If there was a fly in the ointment, it was the rather uneven singing of the valkyries, which, given the wealth of talent at the Munich Opera, should have been easy to cast. For some reason, the Gerhilde had very little voice and could not sustain her brief lines. It was very unfortunate and very obvious since Gerhilde opens the singing in the Ride of the Valkyries, but in the grand scheme of things, this was a minor quibble. Kent Nagano led both operas with a surprisingly leisurely tempo, but never losing sight of the architecture of the piece. He received the biggest ovations, even more than the excellent singers. Munich simply loves this guy. The one non-Ring operas I've seen so far was La cenerentola - what a jarring experience to go from Wagner to Rossini! It was almost more than my system can bear... just kiddin! 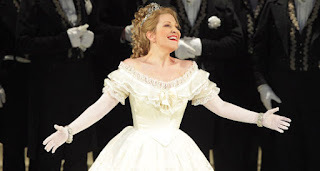 The big draws are the two lovers - Joyce DiDonato as Angelina, probably the best in this role today. Intendant Nicolaus Bachler came in front of the curtain at the beginning, leading to a wave of groaning from the audience. Fortunately, she consented to sing despite a cold. DiDonato was quite careful at first, but grew in strength during her last act aria and finished in a blaze of glory. She received a huge hand from the audience. Lawrence Brownlee as the Prince is the "alternate" to Juan Diego Florez, arguably the most famous interpreter of this role these days. Brownlee was sensational when he sang it in Toronto last season and wowed the audience last evening. The old "black and white" Ponnelle production is showing its age but still functioning quite well - one wouldn't want to "update" this piece with some crazy far-out staging. Conductor Antonello Allemandi led a middle-of-the-road reading of the score. Tomorrow is Siegfried, followed by the DiDonato recital on Saturday and Goetterdammerung on Sunday. Let's hope she will be in full health by then. Can't wait!